How to use Google Keyword Planner? Highest CPC keywords! HomeBlogging and SEOHow to use Google Keyword Planner? Highest CPC keywords! 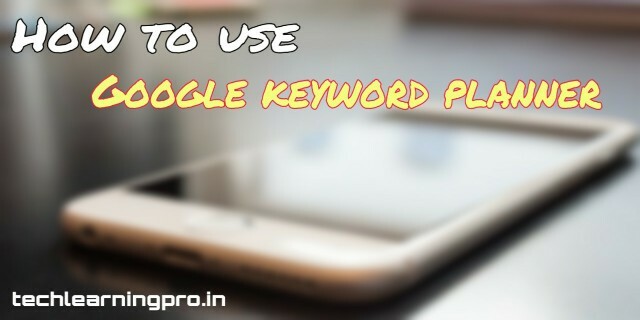 Hello Everyone in this post I am gonna tell you How to use Google keyword planner, How to create a free account on Google Keyword Planner. The Google keyword planner tool helping tool which is specially designed information about the keywords which are searched on the search engine. This tool provides you the information about the competition, volume of traffic and a lot more information about any keyword which may help you in the growth of your blog. So we can say that this tool is helpful for the bloggers. After keyphrase research on Google keyword planner, we can easily get some keywords with high traffic volume and high CPC value which will surely increase our earnings. To use keyword planner you have to create a free account on Google Keyword Planner. But when a user tries to create a free account on Google Keyword Planner they are redirected to Google Adwords, finally, they fail and unable to use Google Keyword Planner. Keyword Planner and use it for your keyword research. 1. In order to create a free account on Google keyword planner, first of all, open your browser. 3. Now you have to visit the official website of Google AdWords. 4. After that, you have to scroll down the page and there you will see ‘Get started’ or 'Start now' written on your screen, click on that to proceed. 5. After you click there, a new window will open on your screen. 7. Now in the next step, you have to enter the details such as your email address, time zone, and currency. 8. Click on save and continue, then it will ask to sign in. 9. Sign in using your email Id and its password. 11. To use Google research tool, Go to tools options. As we all know that Google keyword planner is a Google product, this means that it is genuine, original and a free way to find the highest CPC AdSense keywords to Boost Your earnings. The results of this tool are 100% accurate. This tool is effective and will help to grow your blog and record a massive growth in your blog traffic, and will improve your Alexa ranking. To start keyword research just you have to go on the planner option under the tools section of your account. there you have to enter your keyword and press enter after that a lot of keywords related to that keyword, their CPC value, their competition, and their traffic volume will be displayed on your screen. Google keyword planner provides a variety of tools by which you can target a specific country, specific time and a lot more. So this was the whole process of Google keyword and account creation. In last I would like to say that if you like this post then please share this post with your friends, for any query or suggestions please use the comment box or you can visit our contact us page.